Hello everyone! 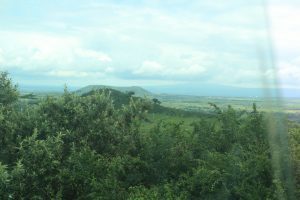 We are on our third day out here in Kenya and it's awesome. Wanna know why it's awesome? Great, read this. Yesterday we woke up and had a wonderful breakfast as a team. We indulged on some fruit, beef sausage, and some little bread things (called Mandazi). We left a little earlier than normal due to rain, to take the more mainland (LONG) route. 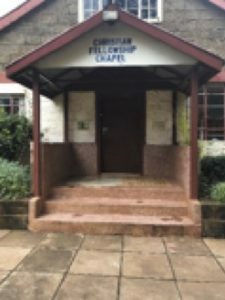 We arrived at Rift Valley Fellowship in Maai Maihu and we were excited for what the staff had planned for us. We split into 3 groups, each group had one person from the RVF staff and we traveled alongside them to visit homes of church members. We were just going on this visit to talk with them, learn more about their stories, and pray with them. One instance we remember was a woman named Julia. She was a mother of 8 children, 3 of them were college students (like us) their names were Kevin, Jason, and Allen. They lived in a house made of stone with at least 2 rooms that we were able to see, which is actually larger than some of the other houses we went to. The house was dark, no electricity, or any running water (that we knew of). Outside there was a fenced in courtyard with a garden, where they would grow food to eat and to sell. We huddled around a couple couches and began to ask questions to Julia and her kids. We found out that they college kids go through the same problems we do in school. School's tough we all know it. We gave the kids some words of encouragement to stay the course with school and reap all of its benefits. We prayed together as one group of believers and it was wonderful. Julia was such an amazing example of being selfless, when we were asking for prayer request she would only say things about her children and family. We were all humbled by this family, and we are blessed to have met them. After that, we got some lunch, thats all. Next, we journeyed to the IDP camp, IDP stands for Internally Displaced People. The town was called Mangaza (this word means "light" in order to bring hope to the town and the people surrounding it). Here we once more split into groups of 4 (that rhymed). We walked around a large plot of land and began to visit people to learn and pray with them. 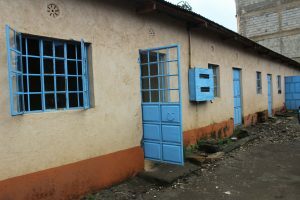 We were amazed at the fact every person fully welcomed into their home regardless of how small it was. Two of us (along side 1st Peter, RVF staff leader) visited a woman named Anna. 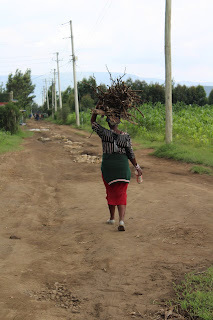 While they were there she shared that she has been struggling with lots of things in her life, such as her family we experiencing extreme poverty, with all the struggles that come along with that. Recently she went to the hospital due to a hemorrhage that she hid from her family, it had caused her to pass out. While in the hospital, she was told she had colon cancer and the doctor noticed signs of depression. They wanted to keep her there for two weeks, but she left to return to her son. The hospital bill was 17,600 some shillings, or about $180. They were struck by how this hospital bill was equivalent to just the money our team had brought along, yet it was going to completely change this woman and her family's life. It was hard to leave these people, but we prayed for all of them. 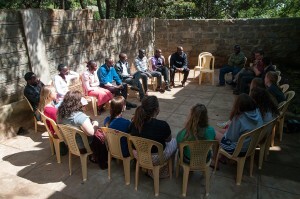 After this, we traveled back to were we met lunch to debrief with members of Rift Valley Fellowship. The pastor, Isaac, told us a bit of his story. His father left when he was very young, and to provide for him and his siblings his mother resorted to prostitution. He was very upset by this and ran away. He struggled to complete school because of this, but after 14 years he completed primary school (which goes to 8th grade). He didn't mention at what point he became saved, but eventually he did and went to a vocational school to continue to catch up on his education. And eventually to America to study theology. His experiences and God is what enabled him to plant his church and go after the people in his community. He told us he sees his mother in the women, his sisters in the girls, and himself in the boys. He is an inspiration to us all. Eventually it was time to finish the day, and we headed back to the guest house. We ate some Kenyan inspired dinner, relaxed for a little. then debriefed as a team to talk about our day. After that we played some games. Jay and Marcia won them both so they probably cheated but we forgive them! That's all folks! Keep us in your prayers and add along the people we met yesterday, Stay groovy.